Cool Ponds has been in business since January, 2001. We are located 5 minutes from the beach in the beautiful city of Dunedin, FL. We Serve all of Pinellas County, Hillsborough County and Pasco County. People fall in love with our pond store as soon as they step out of their car. Some people drive over 150 miles to come to our store!! Our pond store is surrounded by breathtaking landscaping which feature 9 beautiful natural looking ponds with waterfalls, misters, aquatic plants, turtles, koi fish and goldfish. 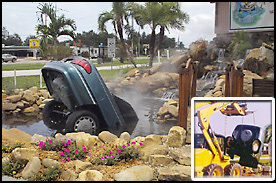 We proudly claim that it is the most amazing pond store in Tampa Bay! As owners of Cool Ponds (George & Melody Ruiz), we enjoy the beauty of nature, water, and landscaping. Our admiration for nature beautifully mirrors into our store. Maybe you heard A little about us: A few years ago we were in all the local news media when we dipped a car into our front pond as an advertising gimmick. The city made us remove it after receiving more than – “50 Emergency Calls (911) !! We have a large selection of aquatic plants; Water Lilies, Taros, etc. We also have self contained waterfall fountain units. You can get a Putting Green from us too! We also carry everything you need to build, repair, and maintain your pond: Pond Kits, Pond Pumps, Pond Filters, Large selection of Pond supplies, goldfish, koi fish, and much more! Our Inside Show Room will take your breath away! Great tips for foiling critters! We are just building a pond and you might be my new number bsst friend!